The Planned Removal of Toronto’s Jarvis Street Bike Lane Did Not go as Planned with Bike Advocate Arrests. The city of Toronto clearly underestimated the passion of cyclists when it decided to remove the popular Jarvis Street bike lane. When large street scrubbing trucks showed up on Jarvis Monday to remove the bike lane, crews encountered dozens of bicyclists who chose to literally use their rights and lie down to protect their safe traffic lane. It wasn’t long before the police were called to crash the party. The painted divider for the bike lanes on Jarvis Street was voted out by the City Council to aid in the addition of another vehicular lane to the existing four-lane street. This new reversible fifth lane is said to help improve traffic flow and congestion. The bike lane was an initiative put in place by Mayor Ford’s predecessor David Miller. The bike lane was part of Miller’s safety plan, which improved the urban biking environment for dozens of commuters. Many citizens agreed, including freelance writer Steve Fisher, who noted that he was hit twice by passing cars before they installed the bike lane. Although cyclists received a one-day reprieve, bike-lane removal is set to continue today, and there seems to be no clear resolution for what bicyclists will do on Jarvis Street. Arrests have been made by the Toronto Police, and though protesting will keep the public eye on the problem, it will be difficult to stop it now that the police are stepping in an arresting protestors. 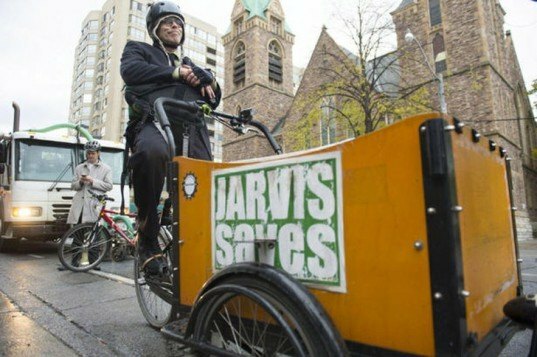 There is concern that other cities in North America could follow Toronto’s lead, and as a result, bike advocates around the continent are keeping a close eye on the situation. These kind of urban transportation alterations, or what I call regressions, don’t seem to make any sense when it is estimated that this removal along Jarvis street will cost around $300,000.